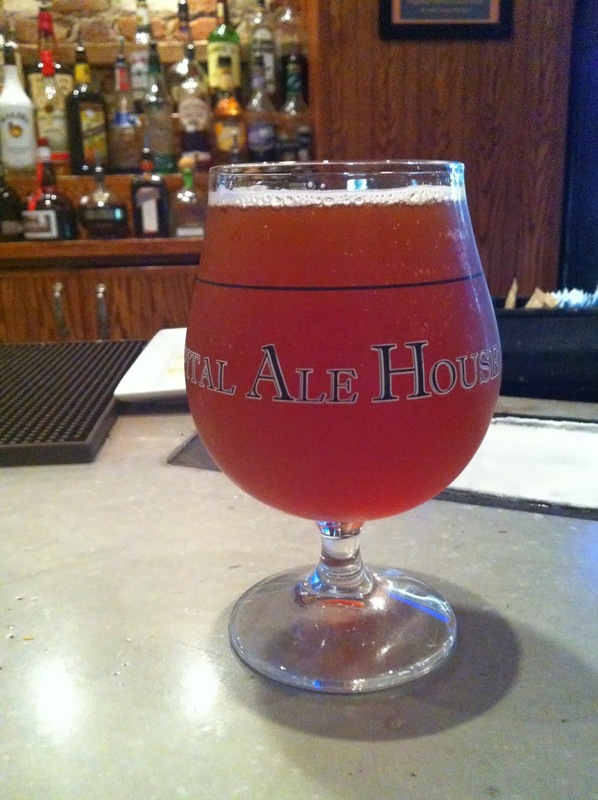 Each month Capital Ale House taps a special beer that's been aged for the past year. The December "Ales From the Crypt" selection was Stone Brewing 12.12.12 Vertical Epic Ale. It seemed as good a reason as any for an evening out. I don't recall that I ever had release in the Stone Vertical Series, and the beer could only have gotten better with time. I always enjoy the appearance of a beer, and the Belgian Strong Ale looked quite appetizing in the snifters. Served a touch too cold for my tastes, I admired the beer and let it come up to temperature as we perused the dinner menu, and Colleen arranged the social media photo shoot. Stone 12.12.12 had a surprisingly mild aroma. We picked up molasses, vanilla, ginger, along with some Belgian yeast. The flavors came out much the same with a stronger presence. Some dark coffee and roasted notes are added as well. The mouthfeel is thick with a long-lingering, dry finish. The beer was quit enjoyable and the well-blended flavors I suspect were only enhanced by the year spent waiting in the cellar. On a serendipitous note, a friend of Colleen's on FaceBook saw the above picture posted, and inquired back, "Bottle or draft?" Colleen answered and the reply back was "We're our way!" A bit later in the evening we were joined by another couple. As it turns out, the husband is a craft beer fan AND shooting enthusiast. Any guesses what we talked about most of the evening? As I looked over the row of tap handles, trying to decide on my next beer, I spied a Blue Mountain Barrel House handle, and learned that Dark Hollow Imperial Stout was behind that lever. Dark Hollow is a Bourbon barrel aged Imperial Stout. That aging treatment is apparent in the aroma, as the sweet bourbon and dark coffee notes waft from the glass. The beer is not overly boozy, but neither is the alcohol masked. Tastes of dark chocolate, coffee, molasses and vanilla are also present. The mouthfeel is thick and smooth. This is an exceptional Bourbon barrel stout. Since we were now joined by friends, it was only sociable that I enjoyed another beer. Also sighted on the tap row was Lickinghole Creek Brewery. I posted on this new new Virginia brewery last year, but have never had the opportunity to enjoy their beers. The beer being poured was Gentleman Farmer Estate Hop Ale. I think this is the first beer from the Goochland brewery to make it to Fredericksburg, so my evening of good beer would conclude with another Virginia-brewed libation. Gentleman Farmer Estate Hop Ale is an Amber Ale brewed with Cascade, Columbus, Nugget and Chinook hops grown on the brewery's farm. The beer has a thick viscous appearance, and the bubbles seem to rise slowly in the glass. The aroma was very mild, with subtle bready malt and citrus fruit notes. The flavor, and mouthfeel, followed the sights and aromas. I found the beer to have a very clean and refreshing taste. I savored the subtle flavors, especially following the big and bold of the previous beers. I'm looking forward to trying this one again, as well as some of the other Lickinghole Creek beers. It was a fun evening, filled with good beer and conversation. I enjoyed the California-brewed Stone Epic Ale, but I remain partial to the beers of Virginia. The evening's treats from Blue Mountain and Lickinghole Creek breweries are just two of the reasons for that preference.